It’s time for a new sweater! This one’s for my husband, and I’m not going to make it into a pattern or anything (which feels oddly luxurious- I guess I’ve been writing a too many patterns). I actually ordered the yarn back in the fall, when the plan was to knit this sweater as a Christmas present. Of course, things happened, and I ran out of time. Isn’t that the way it goes? 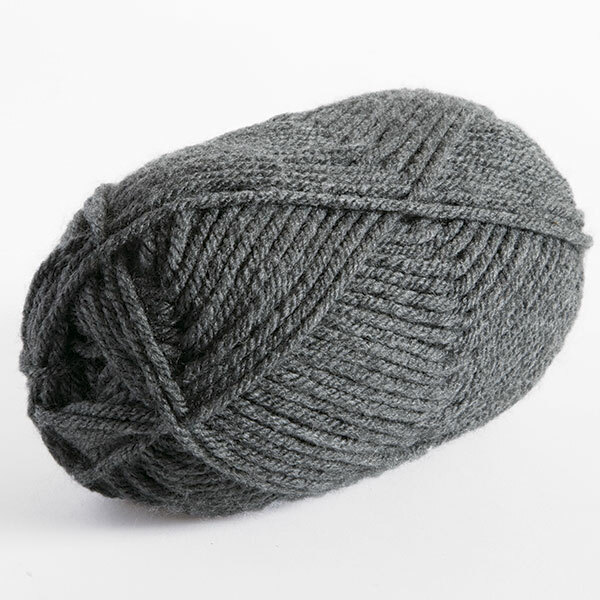 Anyway, I ordered a bunch of skeins of KnitPicks Brava Worsted in Cobblestone Heather in their last big sale. Brava seems like a decent alternative to wool. It’s nice and soft and squishy, and actually has a bit of wool-like spring. Unfortunately, it has a bit of that “acrylic sheen” to it, so I think it looks a little cheap- but that’s probably something that only a knitter would notice. 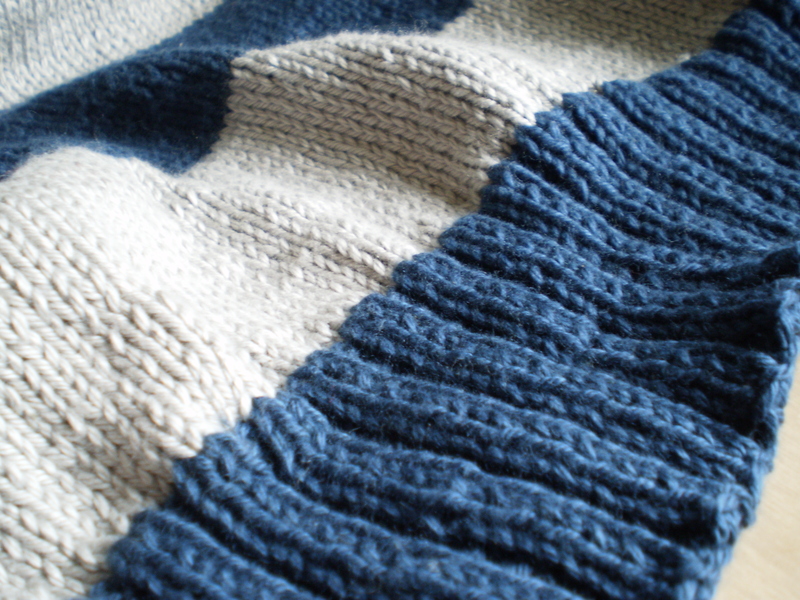 I’m thinking of doing either a crew-neck or a heneley sweater, top down (because I love me a good top-down sweater. Seriously, if you’re even thinking of improvising your own sweater, try Ann Budd’s book Top-Down Sweaters. It’s the best!). I want to keep the sweater fairly plain (because that’s what my husband likes), stockinette, but featuring some subtle texture across the shoulders and chest. Something like this: The top portion is a simple moss stitch, which I think would look good across the top part of a men’s sweater. The bottom is just stockinette (so I can measure gauge). In between, I tried a couple things to figure out the transition. On the right, I just went straight from moss stitch to stockinette, and on the left, I added a couple rows of reverse stockinette. I think I like the reverse stockinette stripe, I think it would add structure and a bit more visual interest to the sweater. But I have a little time to figure it out before I get down to the transition point. This entry was posted in On My Needles and tagged ann budd, husband, knit, men's, pattern, pullover, sweater on February 19, 2016 by onemilljellybeans. I think it’s high time that this dang sweater stops looking like a muscle shirt when my husband tries it on. Don’t you agree? The only problem is that he’s not a fan of the fairly over-sized sleeves that the original pattern calls for. Ugh. Nothing is ever simple. So, it’s time to get out my scratch paper (or rather, the back of the pattern), my calculator and start figuring out what I need to do. 1. I have 82 stitches (about 20 inches) at the top of the sleeve, set aside from when I split the body for sleeves. 2. I need to get down to about 40 stitches (about 10 inches) at the top of the cuff. If I need to go from 82 to 40 stitches, I need to do 42 decreases somewhere on the sleeve. I’ll do two decreases per decrease row, so I’ll need to do 21 decrease rows. And, I want to space those decreases out evenly over 105 rows, so I’ll work a decrease row every 5th row. 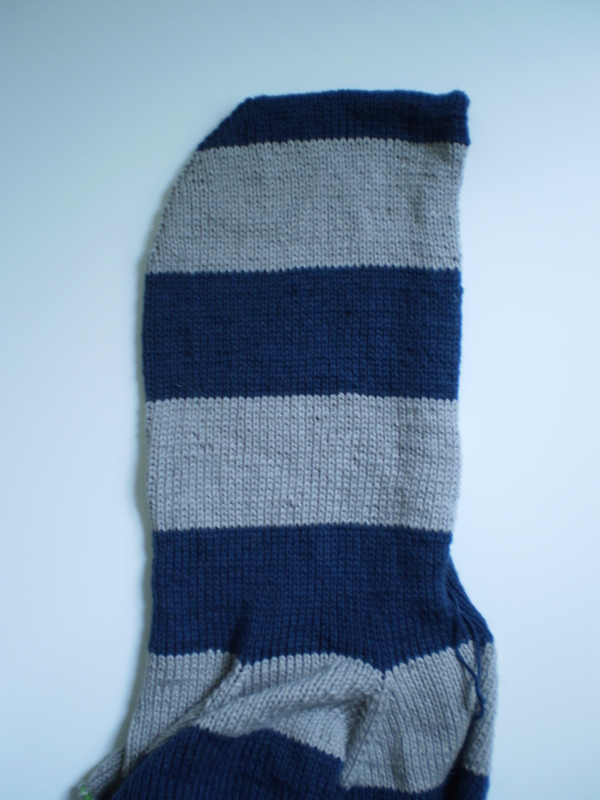 So that means, I’ll knit four rows evenly (while still making sure the stripe pattern matches up with the body), then I’ll work a decrease row (knitting all stitches, except for working two decreases at the underarm). Easy! Hopefully, this’ll look good. It’s a more extreme decrease than I usually use for sleeves, but it might work. Luckily, I’ll be able to finish one sleeve, have the husband try it on, and get his approval for the next sleeve (or, heaven forbid, find out I have to redo the sleeve! Cross your fingers for me). Have you ever had to rejigger part of a pattern? How did it turn out for you? 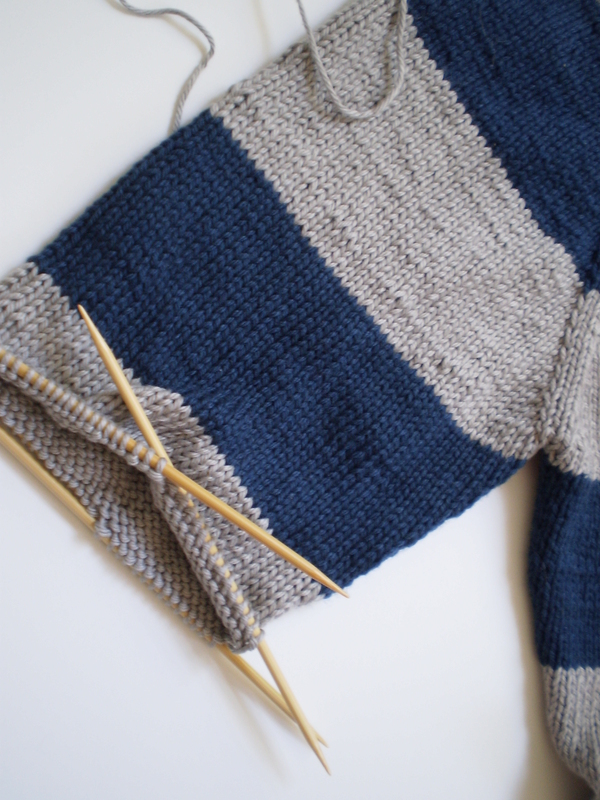 This entry was posted in On My Needles and tagged cardigan, emilien, husband, math, men's, men's sweater, sleeve, sweater on May 29, 2015 by onemilljellybeans. Anyway, this time, I knit up the button band (or rather, the zipper band). Instead of using the pattern, I used my own standard button band (mostly because I lost my paper copy of the pattern). My button bands actually start when I’m knitting up the sweater body. I always slip the first stitch of each row. This creates a nice, neat edge that makes it easy to pick up stitches evenly all the way around. And I’ve found that picking up one stitch for every two rows makes a button band with just the right tension. This way, you don’t even have to count, except for making sure you have an even number of stitches to make your ribbing come out right. 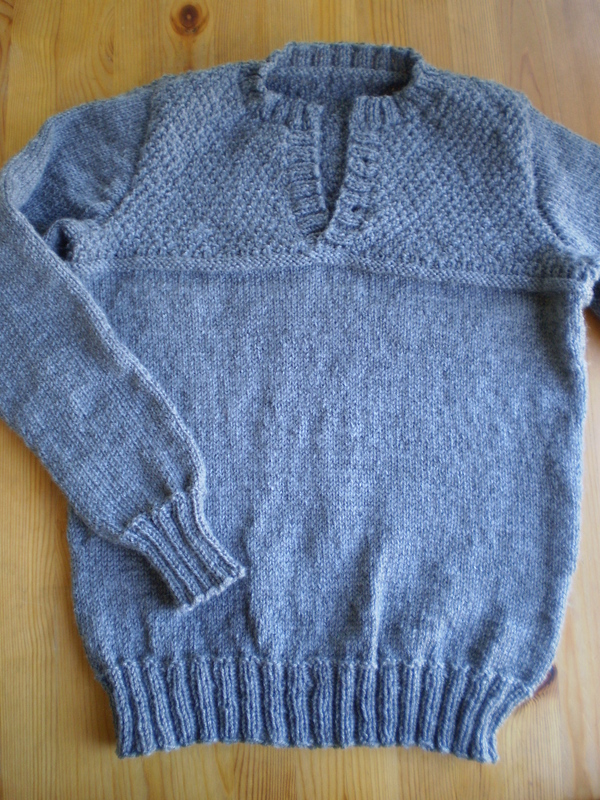 I worked the button band on this sweater for about an inch, in a 2×2 rib. This is a little narrower than my usual button bands, but that’s because I’ll be using a zipper, not buttons. If you use buttons, the button bands will overlap, so you’ll need a wider band. If you use a zipper, the bands don’t overlap, so you need a narrower one. Next up-I’ll start working on the sleeves! This entry was posted in On My Needles and tagged band, button, button band, cardigan, emilien, men's, men's sweater, sweater, zipper, zipper band on May 18, 2015 by onemilljellybeans. I admit, it’s been a while since I updated you on the sweater situation (almost a month-eek!). I’ve been busy with some dog stuff, some quilting, and generally catching up with other projects around the house (I even tried my hand at some very simple woodworking- I made a slightly wobbly window seat for the dog!). But, I’m back on track with my husband’s sweater, and have the hood all finished! Instead, I based the shape of the hood off of my husband’s favorite hoodie. I measured the height of the hood from the neck to the crown. This was the total height of my finished hood. Then, I measured the hood from the neck to the start of the head-shaped curve. This was how far I would knit before starting my decreases. I picked up stitches from the neck, and knit even (in pattern) for about 8 inches. Then, I marked the center back of the hood and started decreasing on either side of the mark. At first I decreased every fourth round, then every other round, then right at the top of the head, I decreased every round. Finally, I grafted the hood together at the top of the head to make a seamless-looking hood that fits my husband (almost) perfectly. Next, I’ll start working on the button band, once I get up the energy to pick up all those stitches! Have you ever changed a part of a pattern? What did you change and why? This entry was posted in On My Needles and tagged cardigan, emilien, hood, husband, husband sweater, men, men's, men's sweater, sweater on April 20, 2015 by onemilljellybeans. As I mentioned before, I decreased very slightly down the torso, to make the sweater a little bit fitted. 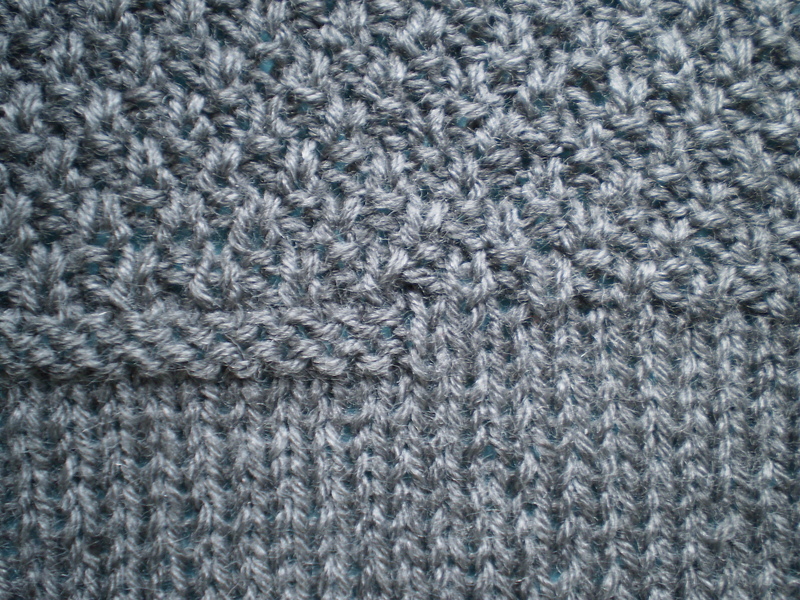 And, the row before I worked the ribbing, I used a trick I learned from Elizabeth Zimmerman. I decreased every 10th stitch ([k8, k2tog] across). It seems like a lot of stitches to get rid of at the end. But, it’s actually the perfect amount to decrease to make a nice, tight-fitting hem, instead of one that flips and curls away from the body. Now, I’m on to the hood. Which I might need to modify, too. 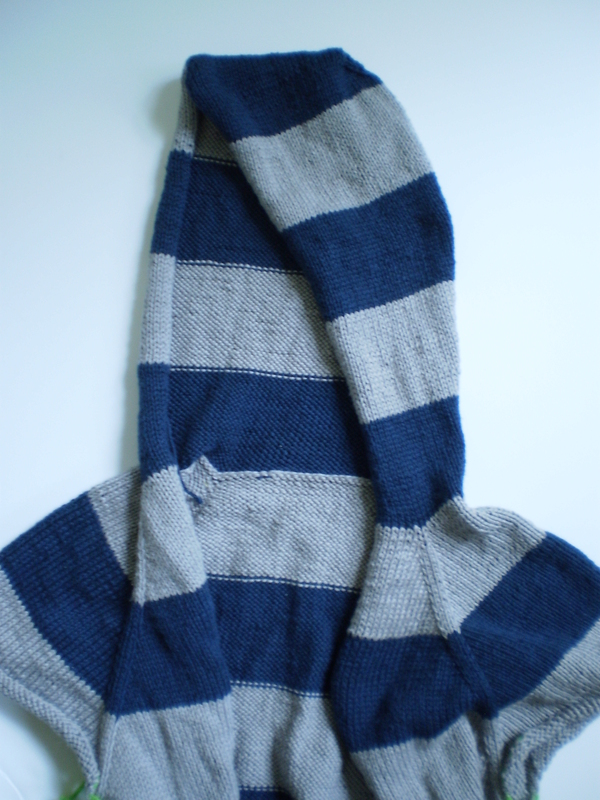 The hoods on all the projects on Ravelry are a little Assassin’s Creed-y. But, a big hood isn’t a big deal, I suppose. Most of the time it’ll be just hanging down my husband’s shoulders, anyway. I’ll have to think about it, and how much effort I want to put into changing the hood. 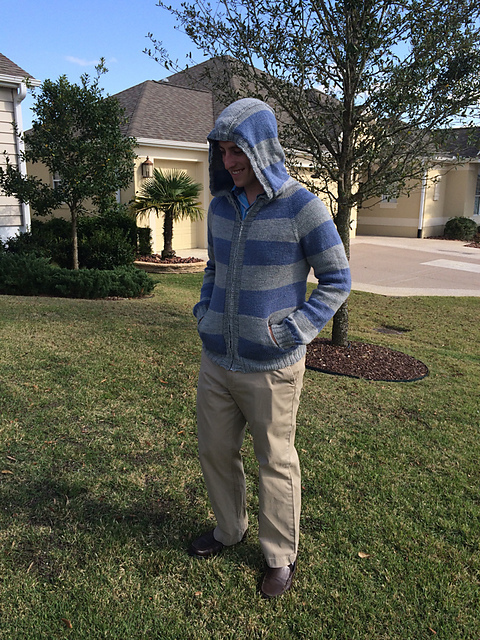 Have you ever made a hooded sweater? How did it turn out? 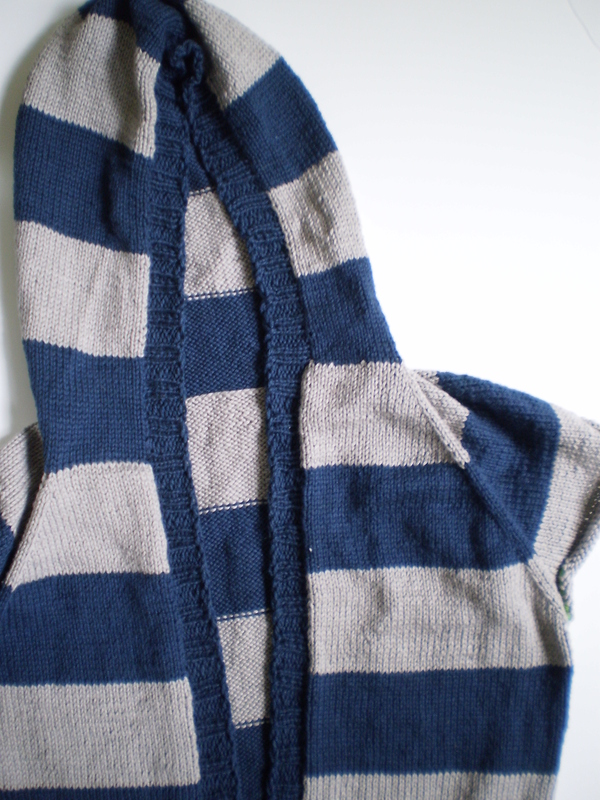 This entry was posted in On My Needles and tagged cardigan, emilien, hem, hood, husband, men's, ribbing, sweater on March 25, 2015 by onemilljellybeans. This year, I didn’t even try to get my husband’s Christmas present finished in time. I didn’t even have time to start it before Christmas. Instead, when we did our gift exchange, I told him my plan. I am going to make him a sweater of his choice. And, because the last one I made for him never gets worn (except when we go back to the Midwest for Christmas Break), I asked him to pick out everything about the project, so that he would end up with exactly the sweater he wants. I could see Tristan wearing this sweater all the time. It’s simple (almost too simple), and very manly. No goofy colors or weird stitches. Not even a button band. I know! Crazy! Colors! Stripes! A hood! But, as surprising as it was, he was very sure about what he wanted. So, here we go! 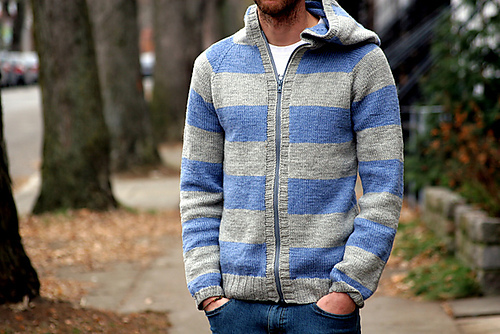 A stripey, zip-up hoodie for my husband. This entry was posted in On My Needles and tagged cardigan, emilien, husband, husband sweater, man, men's, men's sweater, sweater on January 7, 2015 by onemilljellybeans. Hey, guys! I’ve got exciting news! 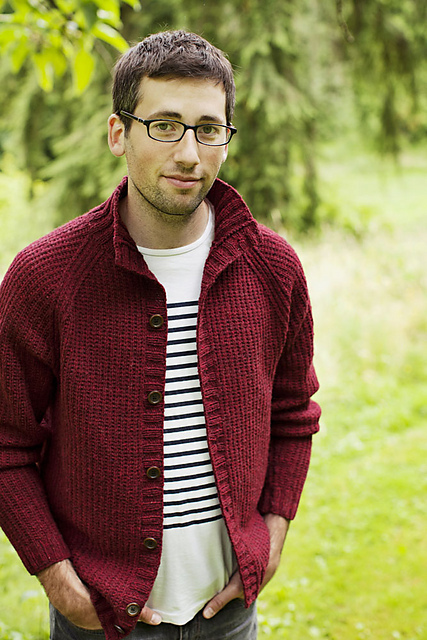 Who’s got two thumbs and is one of Knit Picks’ newest pattern designers? This design has been bouncing around in my head for over a year and was finalized months ago. I’ve been dying to share it with you, and now I can! Woo hoo! Also, look: they even took professional photos with a real-life model (instead of me taking weird-angled shots with my tiny point-and-click camera that eats its battery after five pictures). And, the best part? 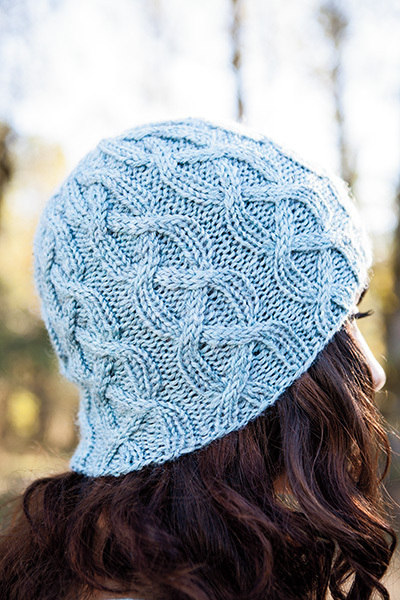 It’s free, and just in time for last-minute Christmas knitting! 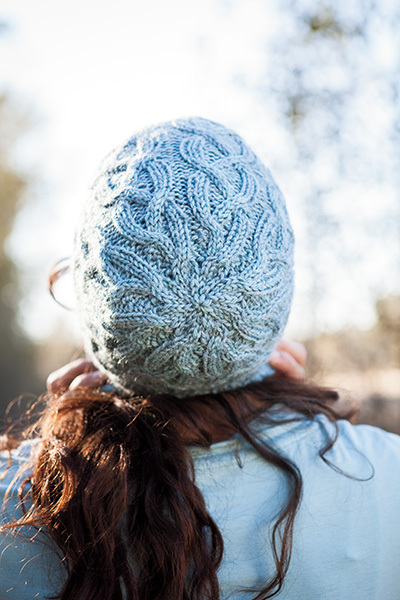 This entry was posted in Patterns and tagged bottom up, cable, cables, cap, hat, knit, knit in the round, knit picks, men's, superwash, unisex, women's, wool of the andes on November 29, 2014 by onemilljellybeans. It’s Father’s Day this weekend, and that means it’s time for lame Father’s Day gifts. Every year it’s the same old same old: ties, golf balls and barbecue tongs. Does your dad really want that? I don’t think so. How about doing something epic? Something awesome. Something that I totally should have planned out months ago, instead of the Friday before Father’s Day. 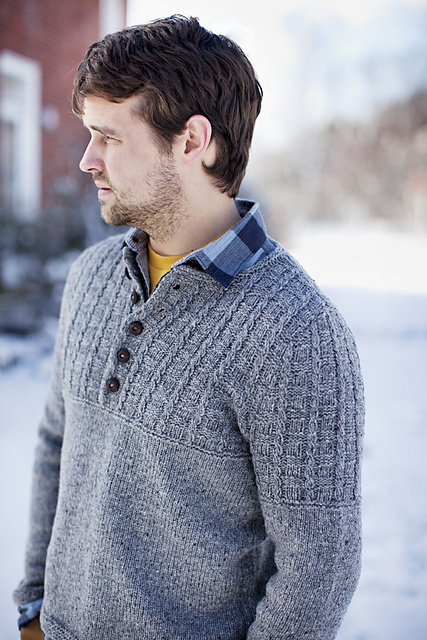 A hand-knit sweater, that your dad would actually wear. 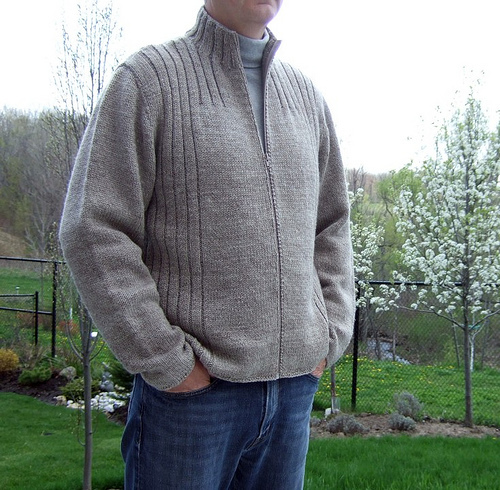 This entry was posted in Inspiration and tagged cardigan, father, father's day, men, men's, men's sweater, pullover, sweater on June 13, 2014 by onemilljellybeans. 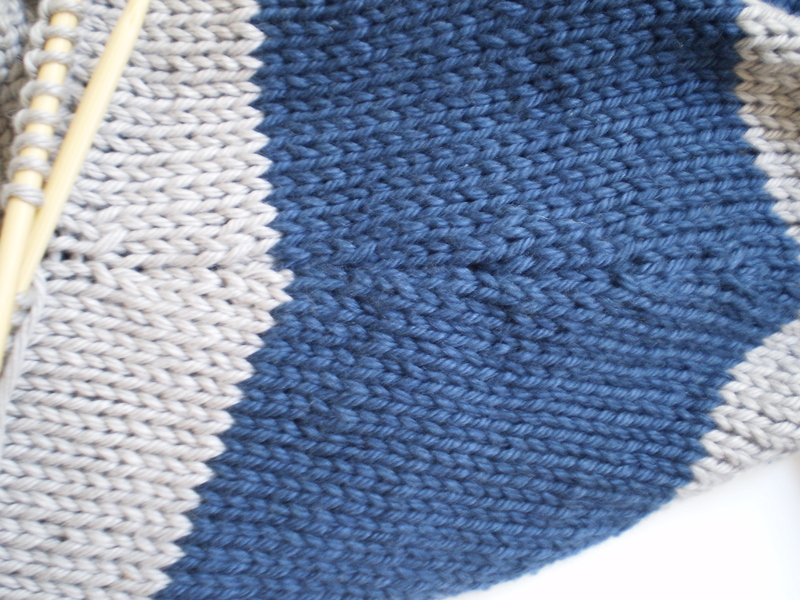 The scarf is actually knit in the round, as one very long, thin tube, like a small sleeve. Because of this, you’ll end up with a double-thick, non-rolling, smooth stockinet scarf. The only problem with this construction is that it can get a tad boring, so make sure you have something good queued up on your Netflix. 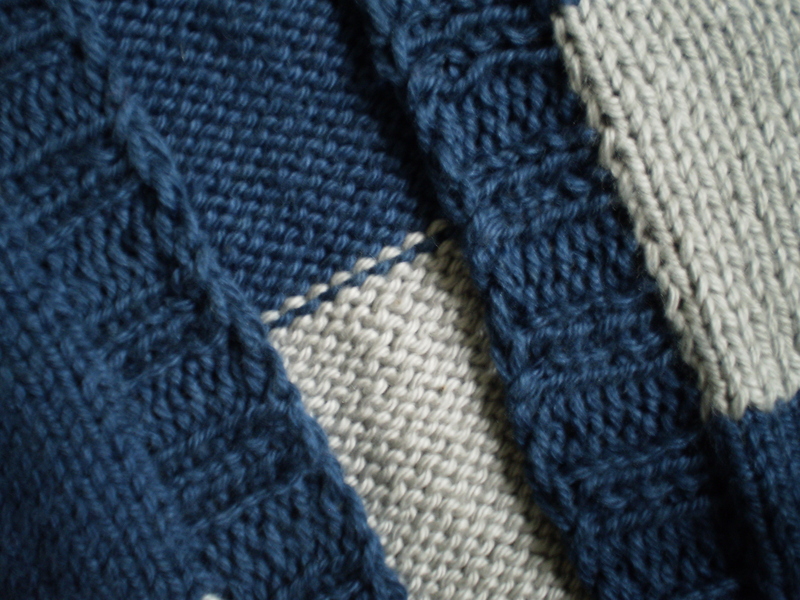 The ends of the scarf are finished off with a simple fringe that serves two purposes. First, it’s fringe, which just looks snazzy. And, second, it closes up the ends of the scarf, so that you have a nice, double-thick scarf, not a weird tubey-thing around your neck. If you/your guy is not interested in fringe, a neat whip stitch will finish the ends just as effectively. 1. 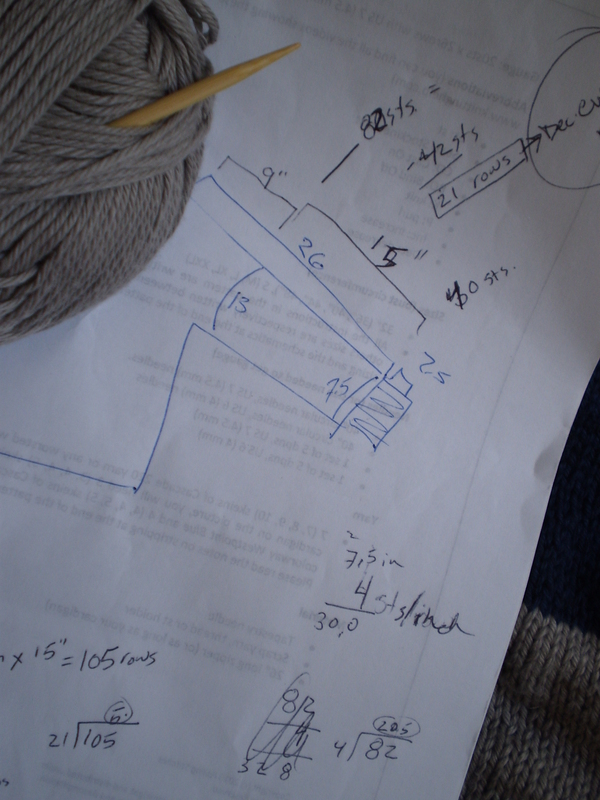 Cut fringe: Measure and cut 50 10-inch pieces of your yarn. These will be your fringe when you’re done knitting your scarf. Set them aside until later (I recommend protecting them in a Zip-Lock baggie or something, just to be sure they’re safe). 2. Cast on 50 stitches. Place marker (if you like; it’s not technically necessary), and join in the round. Work in stockinet (knitting all stitches) until your first ball of yarn runs out. 6. When you’re just about out of yarn, bind off. 7. Apply fringe: Dig out your fringe pieces from wherever you hid them. Lay out the scarf flat (so that it looks like a scarf, not a sleeve), with one short end facing you. 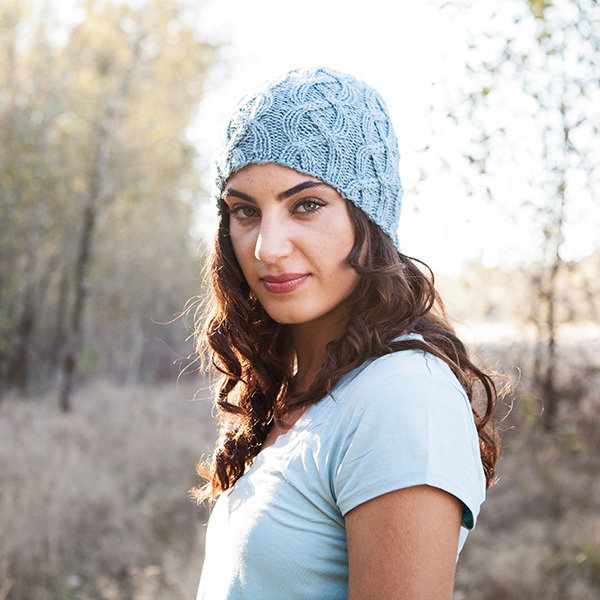 Slip the crochet hook through both layers of the scarf, just above the cast-on or bound-off edge. Pick up and fold one of the fringe pieces in half. Use the crochet hook to pull the middle of the fringe piece partway through the scarf end. Then pull the cut ends of the fringe through the loop you just made. Pull the fringe tight. Repeat the process so that 25 fringe pieces are attached to each end of the scarf. When you’ve attached them all, trim any pieces that are a little wonky. 8. Block: Soak your scarf in warm water for about 20 minutes. Squeeze out most of the water with a clean towel. Lay out flat on another clean towel on a counter or a nice empty part of the floor to dry. 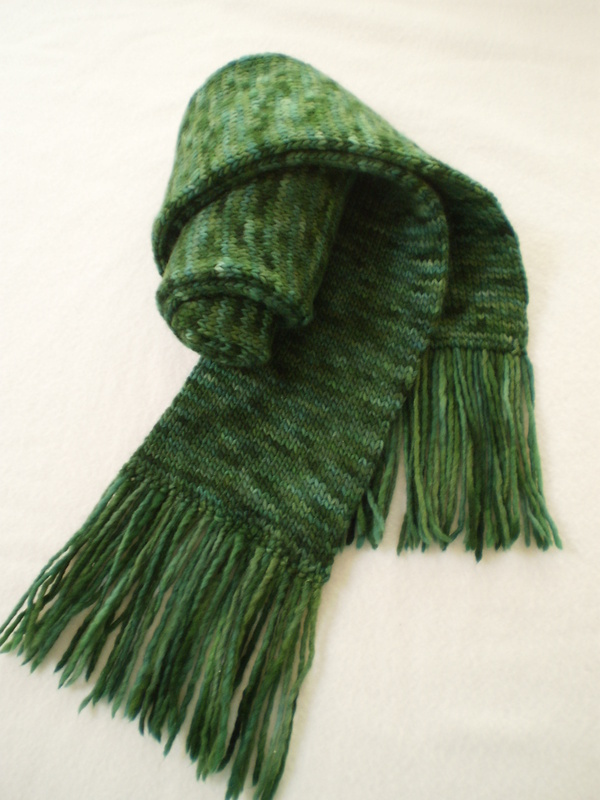 This entry was posted in Patterns and tagged curse, fringe, men's, scarf on March 22, 2013 by onemilljellybeans.